Walker passed away today at the age of 83. Paul Farhi‘s post last Thursday on the last broadcast of legendary radio host Ed Walker, who died early this morning from cancer at the age of 83, has taken on added resonance. 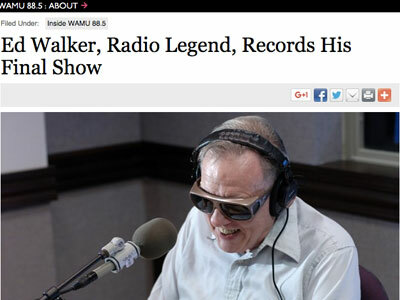 According to WAMU, Walker, surrounded by his family, listened to the broadcast hours before he would pass away in his sleep. Just once more, pleaded Lettie Holman, Walker’s boss. For the audience, she said. For posterity. His daughter, Susan Walker Scola, agreed, urging her father on. Walker reconsidered. Okay, he said. One more. Walker began the show by flipping the script, choosing to share with his audience his own favorites. R.I.P. Ed Walker. Radio's National Treasure. I hope all the Baltimore Bennys out there are observing a moment of silence. RIP #EdWalker voice of #WAMU #BigBroadcast. My favorite Sunday night destination. A voice for the ages.